It is Tuesday, March 24, 1992, and I’m standing with a crowd of people all clutching catalogs and white pieces of cardboard with numbers. Ahead of the throng is an auctioneer. We are at the sale of Shenango China, the equipment, buildings, and grounds. As we walked through the plant, it was impossible not to feel the presence of the men and women who had worked in the plant during its 90-year history. You pictured the lines of print hanging in the Print Shop waiting for a fine craftsperson to place it on the ware as it began its journey. Walking by the kilns, through the Decorating Department, Gold Room, Design Department, everywhere were ghosts, and the sounds of working people making something not only beautiful but useful. It was a product that touched the lives of heads of states and ordinary people. A point of pride. With this exhibit, we explore the many facets of Shenango China from its earliest stages to its final days “A Lasting Legacy” of beauty, artistry, and craftsmanship. In 1901, the New Castle China Company was organized. That year, they purchased the plant of the New Castle Shovel Works, a brick structure 275 ft. long and 80 ft. wide and a handle factory 87 ft. long and 32 ft. wide. To the shovel works, they added an extension 40 by 80 ft. This was the nucleus of the China Company. New buildings were added and kilns. They manufactured vitreous hotel ware and dinnerware for private homes. These operations continued for about four years. In 1901 Shenango China Company was also incorporated and a plant was built on the north side of Emery street. They made semi-vitreous hotel ware and dinnerware. They employed approximately 150 people. In 1905, Shenango China experienced financial difficulty and a receiver was appointed. 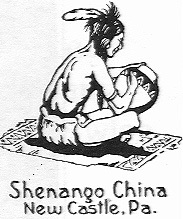 A new organization was effected and a charter was taken out under the name of Shenango Pottery Company. Again, difficulties arose. In 1909 and entirely new group took over the property headed by James N. Smith. Mr. Smith was a novice in the pottery business, he was part owner of the Smith-Kirk-Hutton hardware store. Under his direction, the company began to be established. James M. Smith has always been considered the founder of the company. Shenango China purchased the plant of the New Castle Pottery Company in 1912, and the equipment was moved to the new facility. In March of 1913, the new plant was ready to open. Then came the flood of 1913, covering the plant to a depth of three feet. The opening was delayed until May of that year. They remained in continuous operation until December 1991. Mr. Smith was a man determined to succeed, if a machine did not do what he wanted, he built his own. One of his innovations was having raw feldspar shipped directly to the plant and ground there. The men who started the first potteries in New Castle did so, not because of any clay deposits in the area, but rather because of the soft coal available which was used to fire the beehive Rims of that time. New Castle was at the center of the soft coal industry used in the making of steel. There was also money available for investment. Men in the steel industry had already seen the thriving pottery industry of East Liverpool, Ohio. With the beginning of World War I, the Company experienced sound and steady expansion. They built periodic kilns, ten bisque, ten glost, and one refractory. They also hired their first ceramic engineer at this time. 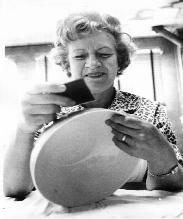 Dorothy Gaibis is shown applying a decal to one of 24 large bowls in the new White House state service. The service, designed by Tiffany & Co., New York, was manufactured by Castleton China of the Shenango Products Division of INTERPACE Corporation. Mrs. Gaibis, after applying the decal, removes water bubbles from under the decal to assure decoration is in complete contact with the ware. From 1909 until 1935, the entire production of Shenango Pottery was devoted to commercial china (hotels, restaurants, and institutions). In 1928 they built the first tunnel kiln and began to fire hotel china for the first time in this country. They also ran porcelain trials researching a vitrified fine china dinnerware product. They abandoned this idea only because of the Depression of the 1930’s. More tunnel kilns were built at this time replacing the beehive kilns. 1929 brought the first labor dispute, when the National Brotherhood of Operative Potters called a strike. The plant continued to operate and the strike was broken by the next Spring. 1936 saw one to the biggest changes at Shenango. Theodore Haviland came to them seeking an American company to make the famous Haviland dinnerware. They were so impressed with the quality of Shenango, an agreement with just a handshake was made with Mr. Smith. Many reasons have been given for the Haviland move to an American manufacturer – the impending war in Europe high duties on imported china and mounting costs. From 1936 to 1958, Shenango Pottery Company made china for the Theodore Haviland Company of France using their formula, blocks cases, decals, etc. which the Havilands brought here. This ware was marketed with the trademark “Theodore Haviland New York made in American.” This china can be found everywhere. A set of Haviland manufactured in New Castle for a dinner honoring King George VI and Queen Elizabeth was sold to the New York World’s Fair in 1939. When the Fair closed this china along with pieces of Lennox china were shipped to the White House for the State Dining Room. This ware was used there during the terms of Franklin D. Roosevelt and Harry S. Truman.